Free on Amazon 10/28/2016 - 10/31/2016! It is the year 1540 on an island that is home to a barbaric culture where three cities under despotic Chieftains have long been at war. Twelve-year-old Rebalagh is a Chieftain's Maiden, the first daughter of the first wife of Samitkan's Chieftain, destined never to marry and perhaps to be sacrificed. By custom, Maidens are reared in freedom to make them happier gifts to whichever gods will receive. Then Rebalagh is captured and taken to wife by an enemy Chieftain with whom she falls deeply in love. 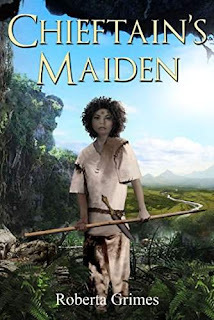 When war between her father and her husband again looms, she risks her life to prevent it, but it seems the only way to save the men she loves is to create a peaceful culture in a world whose gods now ensure there can never be peace. Eventually she comes to see that in order to make peace possible she will have to first vanquish her people's gods.